Kino Lorber and Redemption are proud to announce the Blu-ray release of Frigthtmare by the celebrated cult horror filmmaker Pete Walker. Kino Lorber and Redemption are pleased to release this film in a deluxe Blu-ray edition, mastered in HD from the original 35mm negatives and packed with special features that will make this release a welcome addition to horror fans' collections. Known for his films that blend elements of horror and exploitation, British director Pete Walker's long career in the horror genre spans over forty years. Lurking beneath the blood-soaked of his unabashedly tawdry films is the director's sly sense of humor. NEW YORK, NY - FEBRUARY 27, 2014 - Kino Lorber and Redemption are proud to announce the Blu-ray release of Frigthtmare by the celebrated cult horror filmmaker Pete Walker. Kino Lorber and Redemption are pleased to release this film in a deluxe Blu-ray edition, mastered in HD from the original 35mm negatives and packed with special features that will make this release a welcome addition to horror fans' collections. 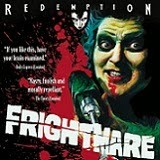 FRIGHTMARE comes to Blu-ray on March 18th, with an individual SRP of $24.95 each. 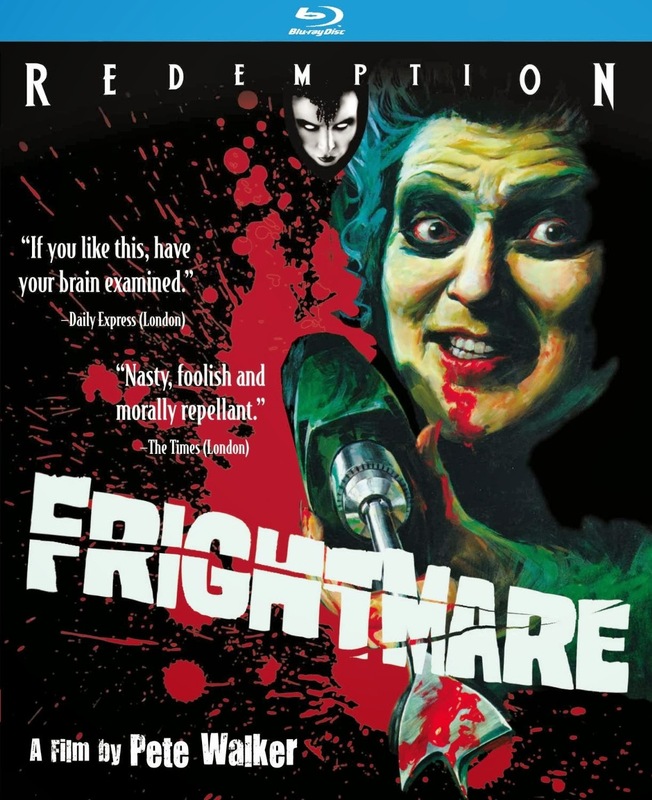 Special Features on FRIGHTMARE include: "For the Sake of Cannibalism," an interview with Pete Walker, by Elijah Drenner; Audio commentary by director Pete Walker and DP Peter Jessop, conducted by Steve Chibnall, author of Making Mischief: The Cult Films of Pete Walker; "Sheila Keith: A Nice Old Lady?" a profile of the late actress, featuring interviews with her former collaborators; and the original theatrical trailer. Known for his films that blend elements of horror and exploitation, British director Pete Walker's long career in the horror genre spans over forty years. Lurking beneath the blood-soaked of his unabashedly tawdry films is the director's sly sense of humor. A former stand-up comic, Walker laced his films with clever wordplay, and took great pleasure in using his scripts to skewer figures of religious and political authority (especially those who dared to impose their sense of morality upon others). Kino Lorber and Redemption have previously released four of Walker's films on Blu-ray and DVD: House of Whipcord, Die Screaming, Marianne, The Comeback, andSchizo, and are proud to continue to bring the works of this unique director, whose films are ripe for re-discovery, to fans in high-quality HD transfers that do justice to his distinctive visual style. Throughout his career, director Pete Walker was no stranger to controversy, but his 1974 film FRIGHTMARE sparked a firestorm of criticism from the protectors of public morals, who deemed it "despicable" (London Observer), "horrendous" (Evening News), and "a moral obscenity" (Daily Telegraph). In spite of the condemnation - or more likely, because of it - FRIGHTMARE has achieved almost legendary status in British horror history. Sheila Keith stars as a former patient of a mental institution, who has settled down in a remote farmhouse, where she tells fortunes in her spare time. But the kind, maternal exterior conceals a dreadful monster, which the asylum, it seems, was unable to cure.